This gorgeous red sequin dress is only 8 months old. 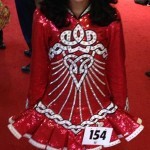 Made by Jillian Howard – Sew Irish. 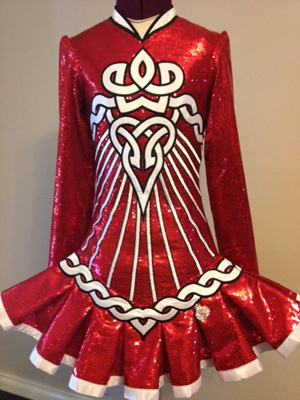 Worn at the 2013 Boston World Championships, this dress features a Claddagh ring inspired design in crisp white embroidery. 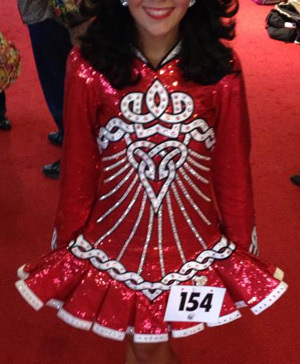 The pleated sequin skirt is also trimmed in white and lined with red tulle. Hundreds of clear Swarovski crystals have been added to the dress to ensure it is very striking on stage. Asking Price: $AUD1500. Shipping costs are not included in the asking price. Sale is final.